I’m going to launch straight into a rave about this shadow – it’s gorgeous. If you don’t have it then I strongly suggest you get to your nearest NARS counter (or order from ASOS as I did…) it really is a stunner. On first glance it’s just a grey and black, fairly standard looking duo. But when you swatch them the colours really come alive. The grey turns into a taupe shade with a shimmer of green in some lights, the black turns into more of a midnight blue/black shade. 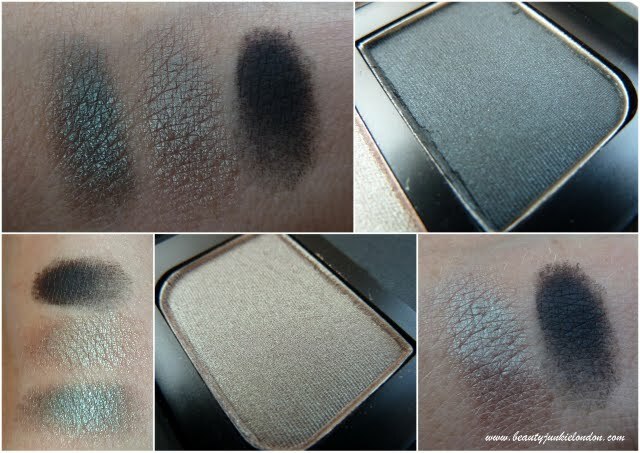 When swatched over each other the colours look even better – a dark purple/grey/taupe/with shimmer/still smokey gorgeousness. I’ve never had anything but lovely quality from NARS shadows, although I have read some reviews where they are a bit hit and miss. Dogon is definitely NOT a miss – I love it! It’s now a staple in my make-up bag and will be a must-have if traveling anywhere for an easy to do evening eye colour. That being said, I’ve been wearing it in the daytime too (more of the paler shade, with the dark one just for definition) so it does work for both. 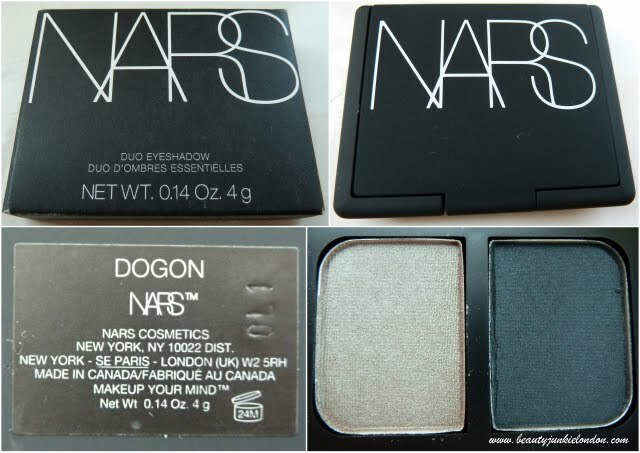 NARS Dogon is part of the Summer collection and is Limited Edition, so if you want it – get it ASAP! I bought mine from ASOS (with the help of one of those £5 off Diet Coke vouchers, so it was under £20 – score!) but you can find it wherever NARS is sold. This was a miss for me. I love the colours but the colour payoff in the paler shade is negligable. I love me some Nars duos but the texture of this and also Nouveau Monde (the previous collection) seems much harder than previous duos I’ve bought and I just cannot pick up any colour with any brush I have. Gorgeous colours. I don’t have many Nars products but the ones I do have are gorgeous – time to add to the collection I reckon!